A concise, meaningful way to organize your life NOW to benefit your family and friends in the FUTURE! Helps for passing on your values and beliefs. Its contents lessen the trauma families face with the death of a loved one. 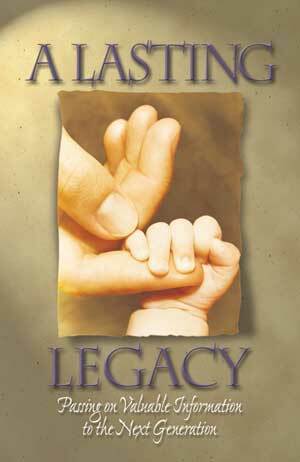 When completed, "A Lasting Legacy" becomes a unique guide that assures that your affairs will be handled as you wish. Reasonably priced at $2.39 each. Click the image below to read the introductory pages and a representative page from the "Collections" section.